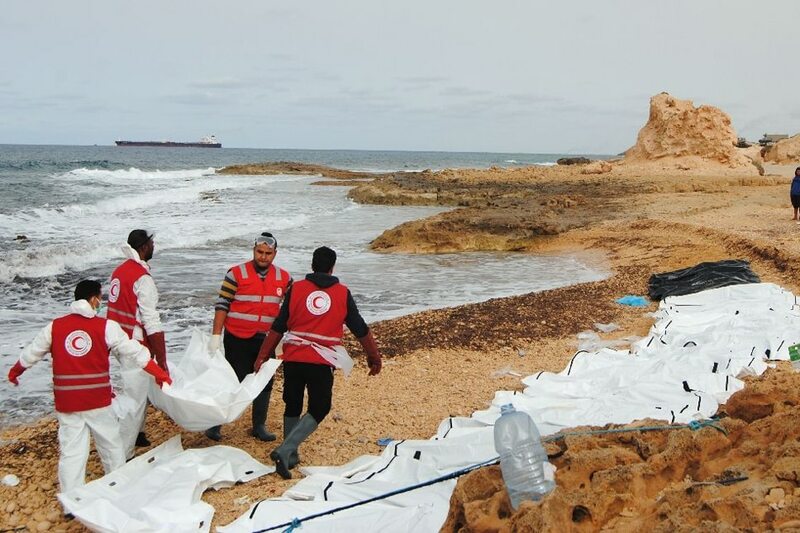 Hamza Turkia with Rim Taher, Agence France-Presse Late Post from Feb 22 2017 07:56 AM HARCHA - The bodies of 74 migrants who drowned in the Mediterranean trying to reach Europe have washed up on a beach west of the Libyan capital, the Red Crescent said Tuesday. A long row of black and white body bags was seen lined up near the water's edge. "We don't have an appropriate vehicle to transport the bodies or a cemetery for unidentified bodies to bury them in," the group said. "Some bodies are still on the beach and others that we can't reach are still floating in the water." "Traffickers reportedly stole the engine and left it to drift," the agency said. "A survivor, reportedly in a coma, was transferred to hospital." The agency said that if confirmed, the deaths would bring the total number of migrants killed trying to cross the Mediterranean so far this year to more than 365. It said that 187 migrants were rescued off Zawiya on Saturday, and were currently being held in a detention center. The tragedy is believed to be the worst since around 180 people were estimated to have died on January 14 when a migrant boat capsized off the coast of Libya. On Tuesday Italy's coast guard said it rescued around another 630 migrants off the coast of Libya from two drifting vessels, a large boat and a rubber raft. "74 bodies on a Libyan shore. Each testament to #indifference, a tragedy, entirely preventable. What price #humanity?" tweeted Elhadj As Sy, head of the International Federation of Red Cross and Red Crescent Societies (IFRC). The IOM said migrant arrivals in Italy had risen sharply this year compared with the same period of 2016. People smugglers have taken advantage of the chaos gripping Libya since the 2011 revolution to greatly boost their lucrative trade. Most departures take place from the west of Libya, usually heading for Italy 300 kilometers (190 miles) away across the Mediterranean. Europeans are considering measures aimed at blocking the arrival of thousands of migrants, alarming NGOs which fear that those stranded in Libya may suffer mistreatment. UN Libya envoy Martin Kobler visited a migrants' camp in Tripoli on Tuesday, and said he would be discussing their voluntary repatriation with the authorities. "They do not have enough food. They have really a serious situation here and it's very important to solve their humanitarian problem," he said. "If they want to return they must be given the chance to return." Unlike previous years, winter has not brought an end to the migrant arrivals, just a reduction in the numbers.